Tripp Lite's B040-016-19 KVM Switch gives you a rack-mountable keyboard, LCD and touchpad in a single console that occupies only 1U of rack space. 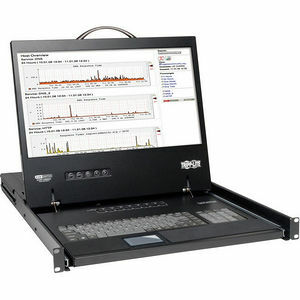 Easy to install and use, it's the cost-effective solution for controlling up to 16 directly connected computers/servers.The B040-016-19 has a built-in 19" LCD screen supports video resolutions up to 1366 x 768. You can switch easily between the 16 ports using on-console push buttons, an on-screen display (OSD) or keyboard hot key commands. Password protection prohibits unauthorized users from accessing the connected computers. With this KVM switch, you can increase the number of connected computers up to 256 by daisy-chaining up to 15 B042-Series KVM switches. Uses Tripp Lite P780-series combo cable kits that support both PS/2 and USB connections without the need to purchase additional cables or adapters. An extra HD15 port allows an additional VGA monitor or an external console to be connected. Add a Tripp Lite B051-000 IP Remote Access Unit to connect from anywhere in the world. An additional USB port lets you connect an external mouse or keyboard. When not in use, the B040-016-19 stores neatly in a rack drawer and pulls out when needed. This KVM console is compatible with all major operating systems. Rugged steel housing stands up to frequent use. Complies with the Federal Trade Agreements Act (TAA) for GSA Schedule purchases.